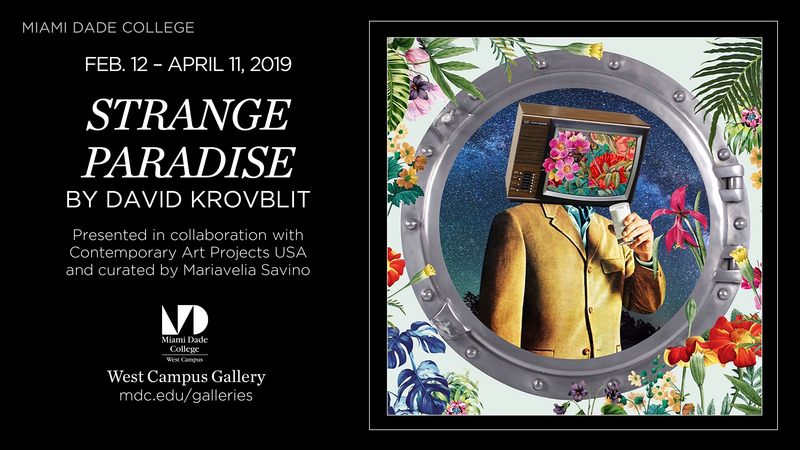 Born and raised in Toronto, Canada, Krovblit studied photography at Ryerson University, cleverly merging his career as a professional advertising photographer with creating artistically celebrated artworks. His Art is influenced by the everyday world, which he interprets depicting an artistic response based on common issues and images that as an Artist he transforms in intriguing and provoking depictions. His powerful images are engaging to viewers, creating very personal relevant thoughts and feelings. To contemplate his collage photography is a visual and intellectual experience. Krovblit has a keen eye for detail and a great skill with the medium. He plays with symbolic images that in his artwork acquire a meaning entirely the opposite, from the delicate or priceless to volatile and surprising. His creations play with the ironic and the unexpected, such as how a symbol of life might become something destructive or vice versa. His visually eye-catching provocative images highlight the contrast of carrying the weight of human history joining with our contemporary society, merging their back story and present creative depictions. At the same time as his concepts can be of a serious nature, his collage combinations create a lightheartedness that makes each piece engaging and approachable, about subjects from different cultures with a unique variety of assembled images and time frames. We can appreciate how his colorful images rise above contemporary issues while exploring social and ecological themes with great humor and intense messages. Surrounded by beautiful earthly flowers and plants, the Astronaut and TV-Head call to love Nature, a possible need for humanity to have to migrate to other planets, the space race to learn about other worlds, the contamination that men produce on Earth and Space. The images make viewers travel from deep seas to the infinite heavenly space. Looking at them, we feel staring out from a spaceship window, to think that no matter the shape or size of the window from which we look, to understand and assume life depends by who we are, what we want to see, accomplish, or believe about. 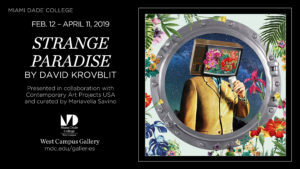 The Artworks by David Krovblit have been featured throughout Canada and the United States in juried group showcases, in solo exhibitions, relevant Art Fairs, such as in Scope 2018 during Art Basel Miami week, where Krovblit was presented by Contemporary Art Projects USA, as well as in Art Wynwood 2019. His Art is part of private Art Collections in Europe, Asia, Canada and the United States of America. Exhibition on display through Thursday, April 11 during regular campus hours.